Hair is a serious matter for black women. 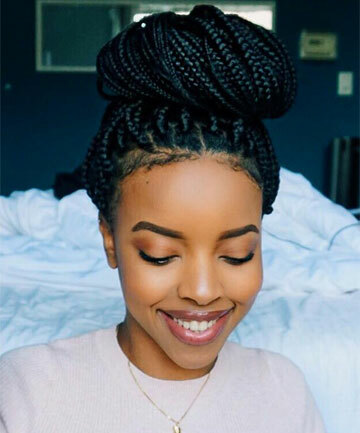 No matter how fussy or laid-back some of us are about our appearance, as soon the temperature rises, like clockwork, we start looking for easy protective hairstyles to limit the amount of time we spend on our hair — and more time having fun. As the name implies, protective hairstyles are a convenient way to protect your natural hair from constant manipulation, as it's safely tucked away and left alone for days or weeks at a time. Plus, when done properly in a way that's not pulling at one's edges, they can even aid in hair growth since you're not yanking or tugging at your hair constantly, leaving it to flourish freely. While there are well-loved hairstyles that hold a special place in the black community, everyone gets bored at some point doing the same thing over and over. Deciding what to do next with your mane can be overwhelming and quite difficult when the options are seemingly endless. Here, we've compiled some unique protective hairstyles to inspire your look this summer.